To create a screensaver from a selected album, click on the "Screensaver from this album" link. To create a screensaver from selected photos, select the photos that you want to include, right-click the last selected photo and select the "Create Screensaver" option. 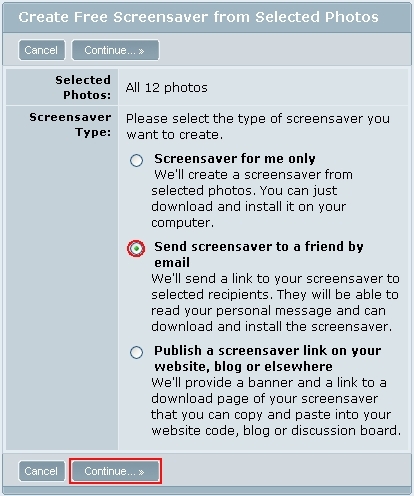 Select the "Send screensaver to a friend by email" option. Fill in your friend's email address, and if you want you may customize your message that will be sent with the screensaver by clicking on the predefined message. Then click on the "Send Screensaver" button. 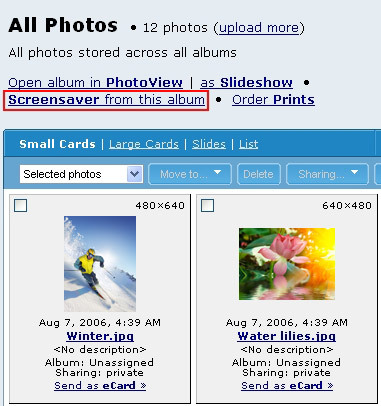 Click on the "OK, Back to albums" button to get back to your photo album. Your friend will receive an email that will include a link to a page for downloading your screensaver.